Features: This Mini iPad compendium is manufactured in padded PU leather with multiple pockets for your iPhone, business cards, brochures and stylus pen. 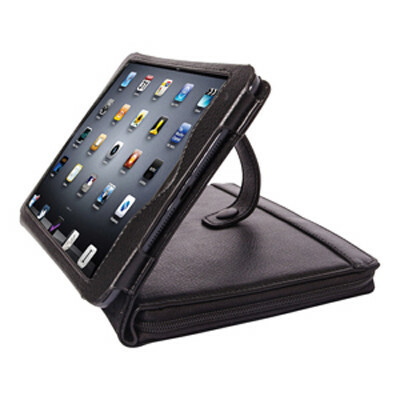 Strap and press stud combination offers both security and multiple viewing angles for your iPad - the ideal executive gift. Exit stock, check stock level. Product Colour: Black. Product Size: 200 x 145 x 30 mm. Print Area: 60 x 60 mm. Print Process: Pad print, Debossed. Delivery: 1-2 weeks (stock) from art approval.. Standard Packaging: Black gift box. Packing Details: 20 pcs per carton, 19 Kgs, 55x43x25 cms. Setups: Included.